Just because you live in a small space home or apartment doesn’t mean that you can’t entertain. There are all kinds of inventive ways to entertain big in a small space. I’ve found ten great ideas to share with you. Bar carts have made a big come back. You can arrange everything necessary for serving drinks on the shelves of a bar cart. You could also serve food from a bar cart. 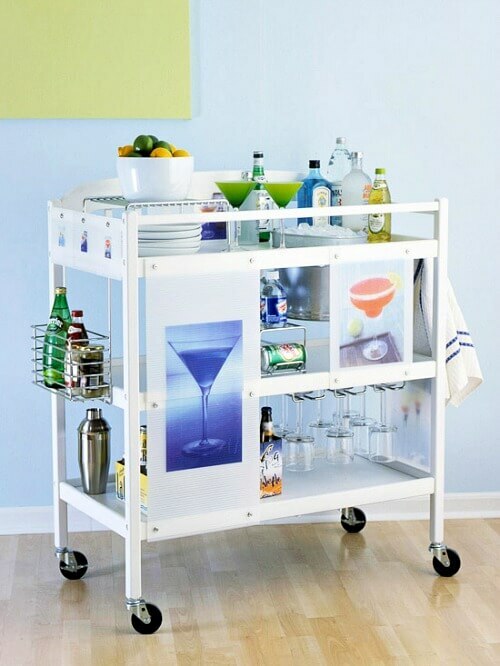 The rolling bar cart can also be pushed from room to room, making it very versatile. You don’t necessarily have to serve a full meal when you entertain. It is far easier to create mini meals with hor d’oeuvres. A little bit of everything means there’s a lot to choose from for picky eaters. You can use existing shelf space for your party. Clear the shelves off and use this space for food or drinks, candles or decor. 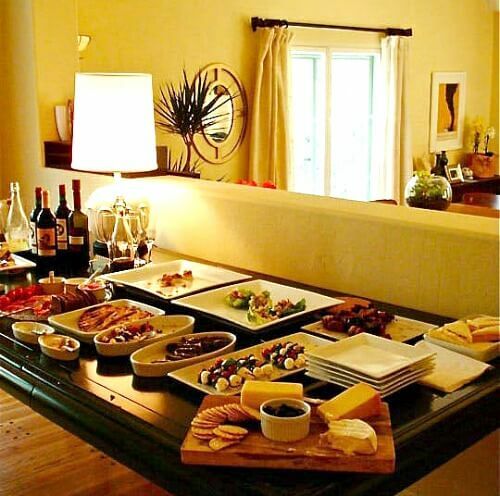 Buffet style parties mean that guests can walk around with their food or drinks and mingle. This way you don’t necessarily have to provide formal seating around a table. Your friends can sit when they find an available space and wander around during the rest of the party. Big pillows can be tossed on the floor for casual seating. Corral them in large baskets or in a hall closet. A potting bench can serve as a beverage bar for party guests. You can use this indoors or outdoors. The container inside can be used for ice storage. You could also serve food on your potting bench. 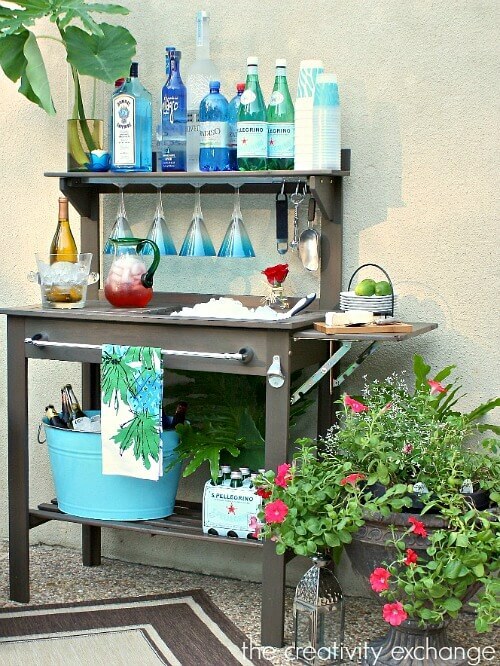 I have a potting bench much like this and can see how this would be a great way to organize and serve beverages for a gathering. 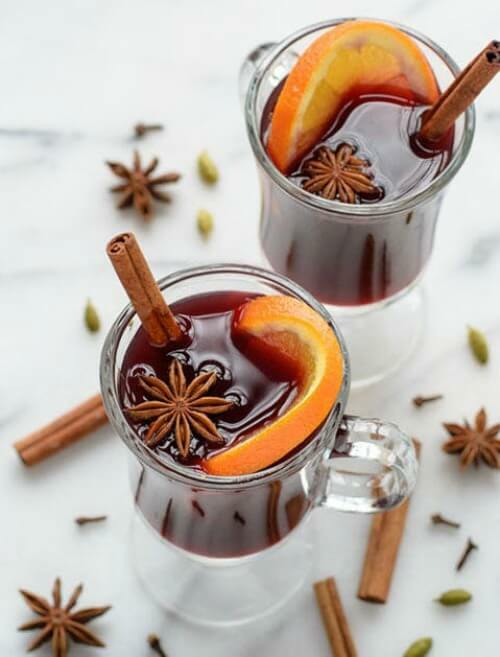 Mulled wine can be prepared and served from a slow cooker. Here are nine recipes for cocktails you can make in a slow cooker to serve at your next event. If you live in an area with moderate winter weather conditions, dine outdoors. 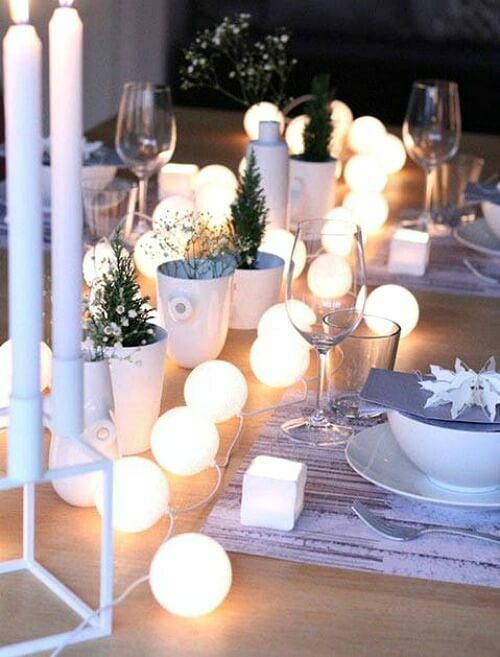 String lights across the table to illuminate the evening while at the same time creating a cozy and warm ambiance for your guests. 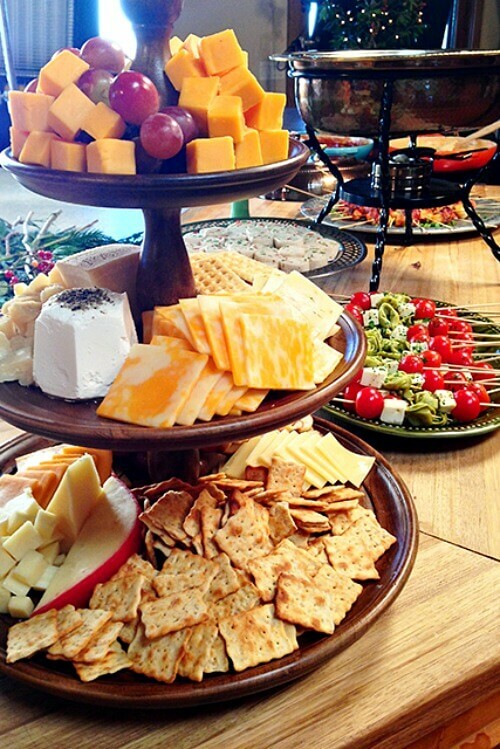 Go vertical and use tiered trays for food. Tiered trays can hold a lot more food than plates and trays. These DIY ice buckets are simple 2 liter plastic soda bottles that have been cut down to size. 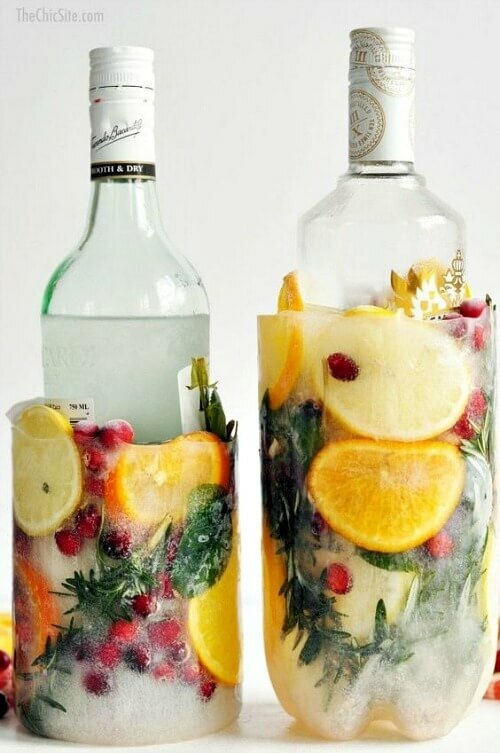 Drop sliced fruit into the water and it becomes visually appealing for a party atmosphere. Click here for instructions. Love, love, love the DIY ice bucket and I’m definitely going to try it! Our house is modestly sized. When we invite a crowd, it’s in summer, when people can spread out in the yard. However, we do a pre-Christmas party for the Festival of Light with about three dozen people. 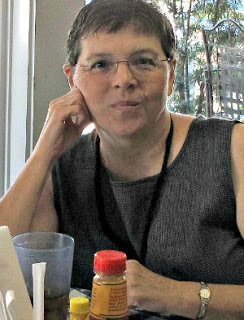 It isn’t possible for everybody to sit–if there aren’t enough seats for everybody, then make sure a good portion of the guests are standing–you don’t want only three or four poor souls without chairs. Standing cocktail parties are quite normal. We do an apéritif dinatoire–a dinner of appetizers–that are easy to eat from small plates while standing–nothing that needs to be cut with a knife and fork. We use real plates–dessert-size white Ikea plates that go with our good china (they have gotten a crazy amount of use over the decades). We don’t have “bad” or “everyday” china–that is a big space saver. I posted about this party before Christmas, with recipes. Living small now I always am looking for great ways to entertain. Great tips Brenda. I love bar carts! Every time I see one in a store I have to go over and take a look. Not sure what I would use it for but one of these days I will buy one. More great ideas! I managed to find a cool vintage bar cart at a yard sale for $13. It needed a little TLC but has turned into a conversation piece too! Brenda, regarding your potting table: I saw an idea on Pinterest for adding those little lights that you push on and off under the top shelf. It was cute! You could use string lights on it too.